History is always "a work in progress." Don't let anyone tell you differently, and don't ever apologize for stating the obvious. IT'S ME AGAIN DOUG DAWG. MY GRANDFATHER CAPP JEFFERSON MOVED TO THE 200 BLOCK OF EAST FIRST STREET AFTER 1899 WHEN HE CAME TO OKLAHOMA. DO YOU HAVE ANYTHING ON HIM? ANYTHING WILL DO AND I CAN FACE BAD THINGS TOO. IT WOULD REALLY BE NICE. THANK YOU IF U CAN. THANK YOU IF U CAN'T. I REALIZE YOU ARE A BUSY MAN. Hi, Brenda, I don't mind looking in the Oklahoman's archives for you ... but those archives haven't been working for several days now. I'm going to call on Monday (later today) to see what's up. If I find anything, I'll comment again here. 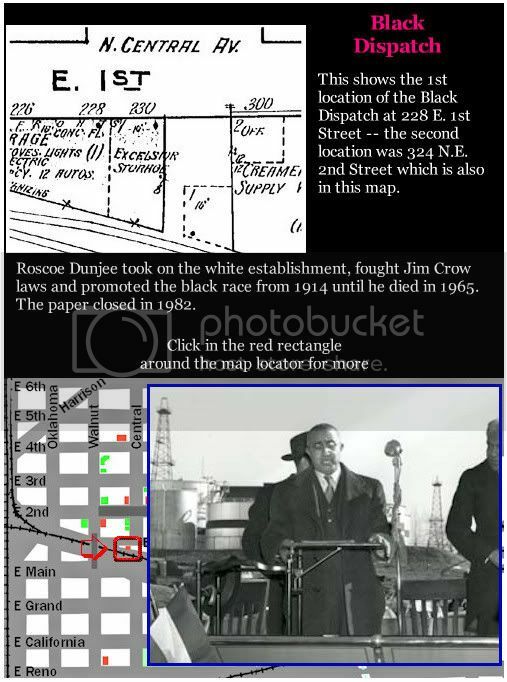 I wanted to let you know that in 1920 the Black Dispatch was located at 300 E Second Street according to the City Directory. So it appears to have moved from 1st street to 300 e 2nd and sometime between 1920-1948 was moved to 324 E 2nd. distance. See the link below for more info.